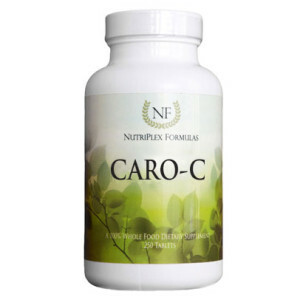 Foods in Caro-C help support skin, veins, gums, lungs and arteries. Vitamins A and C manufacture the building blocks of cellular structures. When those structures become weathered, more Vitamins A and C are needed to rebuild and repair them, as well as to make them stronger, more pliable, and more vibrant. Excellent for blood vessels, skin & more! Wild Pansy, Orange Peel, Spinach Leaf, Carrot Root, Acerola Cherry, Dandelion Leaf, Shiitake Mushroom, Bilberry Leaf, Echinacea Purpurea Root and Adrenal (Bovine, grass-fed, free-range) Substance. Inactive Ingredients: Microcrystalline Cellulose, Croscarmellose Sodium and Organic Arrowroot Powder. In addition to the unique properties, synergists and cofactors of this food, each serving provides the following nutrients, contained within the above food-nutrient blend (not as isolates): Vitamins A, C and D; Carotenoids; Antioxidants; Bioflavonoids (especially Rutin); Biotin; Minerals: Copper, Silicon, Magnesium, Iron, Calcium, Phosphorus, Potassium, Zinc, Sulfur, Iodine, and Selenium; many Amino Acids; Enzymes; Plant Fiber; and more. 6 tablets daily, or as directed by a healthcare practitioner. Vitamins A and C are essential to healing processes, cellular growth and repair mechanisms, skin support and function and repair of smooth muscle tissues (sphincter muscles, valves, etc.) and epithelial and endothelial cells (including arterial walls). As such, inadequate supplies of these vitamins, their synergists and complementary bioflavonoids, commonly lead to skin disorders, eye problems related to insufficient blood supply, and capillary-related problems (spider veins, cardiovascular problems, bleeding gums, etc. ).